1856-1860 autograph album that belonged to Sarah Ellis Way of Greece, New York. The inscribers called her "Sate"; "Sallie"; and "Saidie"; on a page she inscribed with her immediate family, she called herself Sate E. Way. Most of the autographs in the album were acquired at Greece, New York, and Philadelphia, presumably Philadelphia, Pennsylvania. The album was presented to Sarah by H. at Philadelphia, on March 27, 1856. It's a beauty and must have been a treasured gift. The "Floral Album", published by J. C. Riker of 129 Fulton Street, New York, contains ten engravings and five hand-colored floral and butterfly illustrations. It's uncommonly large, at 9-1/4" by 7-1/4", and contains the sentiments of over 50 of Sarah's relatives and friends, some of whom inscribed more than one page. An alphabetical surname list and an alphabetical list of the signers, together with any personal information they offered, appear at the end of this post. Sarah Ellis Way was born in Pennsylvania, either in 1830, as a cemetery transcription shows, or about October 1836 as most Censuses show, the daughter of William Bond Way and Deborah Ann (Ellis) Way. Sarah had four siblings: Micajah E. Way; Annie Mariah Way; William Bond Way; and Bertha M. Way. One page in the album has the autographs of parents and children, including Sarah herself, who called herself "Sate". It appears that someone else wrote Micajah's name, as above his name is the phrase: "Not lost but gone before." Notice the phrase at the top of the page: "May this Circle in Heaven unbroken be." Sarah's sister Annie Maria Way was married to Gilbert L. Kishlar by the time she added her name to the page above, but perhaps she used her maiden name because of the family significance. Annie and Gilbert contributed to another group page. Two of their daughters' names are on the page, presumably added by either of their parents. Also contributing to the page were W. A. Loder, presumably William A. Loder, who inscribed several pages; I. H. B.; Martha G. Schryer; O. A. Ball, presumably Orson A. Ball; and Hattie, possibly Hattie J. Loder. On March 21, 1860, Sarah Ellis Way became the second wife of Simon Butts, son of Christian and Elizabeth (Mikesell) Butts. Simon, born in 1822 in Pennsylvania, came with his family to Greece, New York when he was young. He was first married to Elizabeth M. Lowden, who died in 1855, after having two children, only one of whom lived to maturity: Flora, who married John Desmond of Rochester, New York. Simon died in 1910 and Sarah in 1911. They're buried at the Falls Cemetery at Greece, New York. Read more about Simon and Sarah here. The last inscribed page in the album was presumably inscribed by Sarah herself, describing whatever was once pasted on the page but is now missing. "From my absent friend, at whose request it is placed upon this page, as a Memento of Friendship. Received in a letter in August 1856, Philadelphia". Written in what appears to be an elderly hand; possibly one of Sarah's grandparents. Julia. Shared the page with Lize Upton; Henry Stuart; and Will Upton. Written presumably by Sarah herself: "From my absent friend, at whose request it is placed upon this page, as a Memento of Friendship. Received in a letter in August 1856, Philadelphia" Whatever Sarah pasted on the page is sadly gone, though paste remnants remain. Miles; possibly the Miles Upton who inscribed another page. A. S. C. of Greece, New York. Shared the page with John H. Sperry and Mary S. Sperry. Annie, signed at Greece, New York, on January 25, 1860; Sarah's sister AnnieMariah (Way) Kishlar, wife of Gilbert L. Kishlar. 2-page sentiment left by W. A. L., inscribed at Rochester, New York, on December 29, 1859. Presumably William A. Loder. John H. Sperry of Greece, New York, shared the page with Mary S. Sperry and A. S. C.
Mary S. Sperry. Shared the page with John H. Sperry and A. S. C.
Carrie Upton, signed on September 26, 1859; later note: "Husky girl". Shared the page with Miles Upton. Miles Upton, Esq. ; later note: "He is a brick." Shared the page with Carrie Upton. Lize Upton; not sure of given name. Shared the page with Julia; Henry Stuart; and Will Upton. 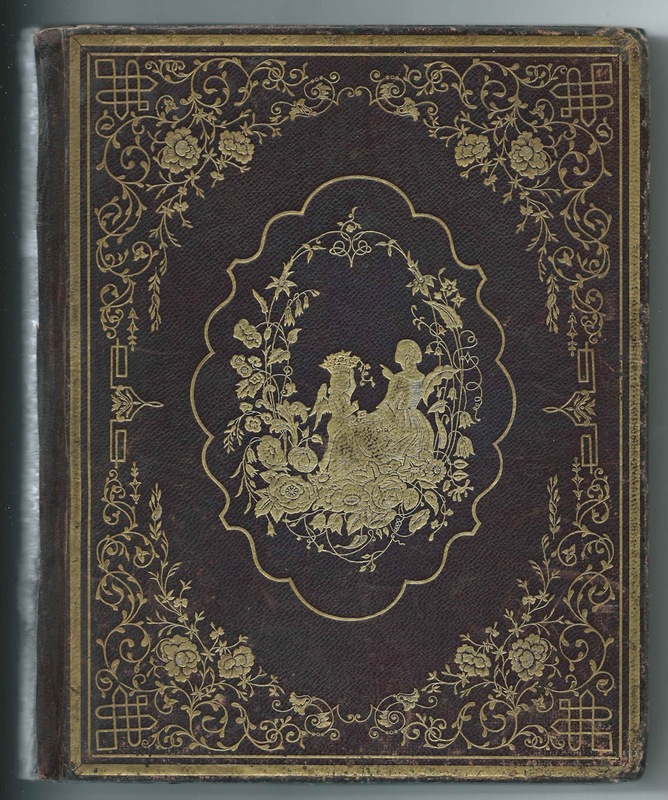 Album presented to Sallie E. Way by H. at Philadelphia, Pennsylvania, on March 27, 1856. She was Sarah Ellis Way, nicknamed "Sate". She inscribed a wonderful group page with her parents and siblings. William B. Way of Greece, New York, signed May 15, 1856; Sarah's father William Bond Way. 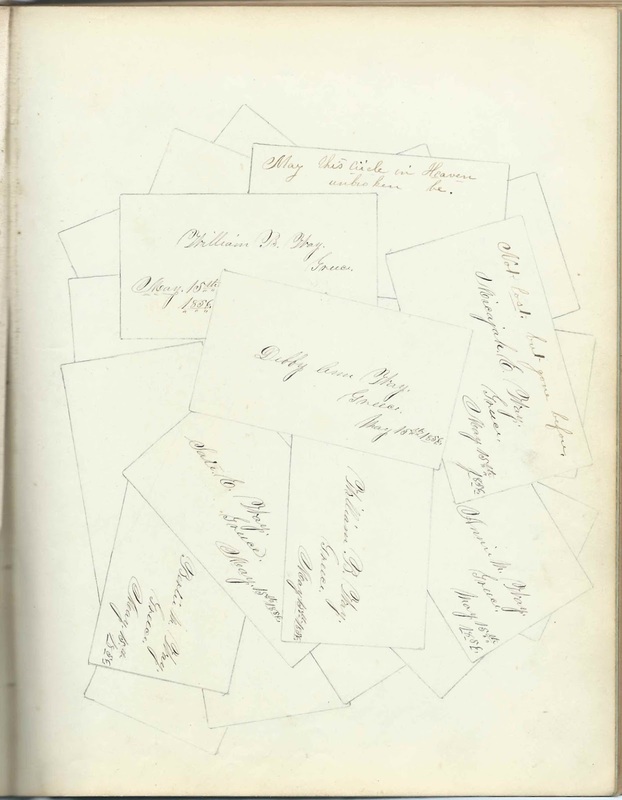 On a family page of the Way family, with autographs of father William Bond Way; his wife Deborah Ann (Ellis) Way; children Sarah Ellis Way; Bertha M. Way; William Bond Way; Annie M. Way and the name, supposedly written by someone else of Micajah E. Way. The page was headed with this phrase: "May this Circle in Heaven unbroken be". Debby Ann Way of Greece, New York, signed on May 15, 1856; Sarah's mother Deborah Ann (Ellis) Way. On a family page of the Way family, with autographs of father William Bond Way; his wife Deborah Ann (Ellis) Way; children Sarah Ellis Way; Bertha M. Way; William Bond Way; Annie M. Way and the name, supposedly written by someone else of Micajah E. Way. The page was headed with this phrase: "May this Circle in Heaven unbroken be". Sate E. Way of Greece, New York, signed on May 15, 1856; Sarah herself. On a family page of the Way family, with autographs of father William Bond Way; his wife Deborah Ann (Ellis) Way; children Sarah Ellis Way; Bertha M. Way; William Bond Way; Annie M. Way and the name, supposedly written by someone else of Micajah E. Way. The page was headed with this phrase: "May this Circle in Heaven unbroken be". Bertie M. Way of Greece, New York, signed on May 15, 1856; Sarah's sister Bertha M. Way. On a family page of the Way family, with autographs of father William Bond Way; his wife Deborah Ann (Ellis) Way; children Sarah Ellis Way; Bertha M. Way; William Bond Way; Annie M. Way and the name, supposedly written by someone else of Micajah E. Way. The page was headed with this phrase: "May this Circle in Heaven unbroken be". William B. Way of Greece, New York, signed on May 15, 1856; Sarah's brother William Bond Way. On a family page of the Way family, with autographs of father William Bond Way; his wife Deborah Ann (Ellis) Way; children Sarah Ellis Way; Bertha M. Way; William Bond Way; Annie M. Way and the name, supposedly written by someone else of Micajah E. Way. The page was headed with this phrase: "May this Circle in Heaven unbroken be". Annie M. Way of Greece, New York, signed on May 15, 1856; Sarah's sister Annie Mariah Way. She was by then married to Gilbert L. Kishlar, but used her maiden name. On a family page of the Way family, with autographs of father William Bond Way; his wife Deborah Ann (Ellis) Way; children Sarah Ellis Way; Bertha M. Way; William Bond Way; Annie M. Way and the name, supposedly written by someone else of Micajah E. Way. The page was headed with this phrase: "May this Circle in Heaven unbroken be". Micajah E. Way of Greece, New York, signed on May 15, 1856; "Not lost, but gone before". Sarah's older brother who apparently had died by the time this page was inscribed. On a family page of the Way family, with autographs of father William Bond Way; his wife Deborah Ann (Ellis) Way; children Sarah Ellis Way; Bertha M. Way; William Bond Way; Annie M. Way and the name, supposedly written by someone else of Micajah E. Way. The page was headed with this phrase: "May this Circle in Heaven unbroken be".